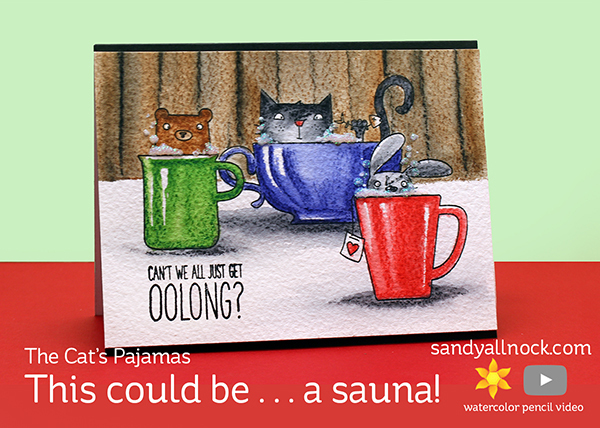 Cats Pajamas: This Could be…a Sauna! Recently, my friend Alma at the Cats Pajamas sent me some stamps – and when I saw these cuties (set is called “This could be vodka!”) in cups, I just had to get them inked up! I colored them with my Inktense pencils – and had fun deliberately letting the pencil and water look jaggedy in particular spots for effect. I love that you have so many options for edges with watercolor! Watch the video below or click HERE to see it in HD on YouTube. So fantastic! Loved watching your creation evolve. What a great stamp set! Your sense of fun always makes my day! I love watching your videos as I always learn something and come away with a smile. Thank you for sharing your abundant talent and delightful view of life. Love it.. I need to break out the Inktense pencils.. I love them and don’t use enough. 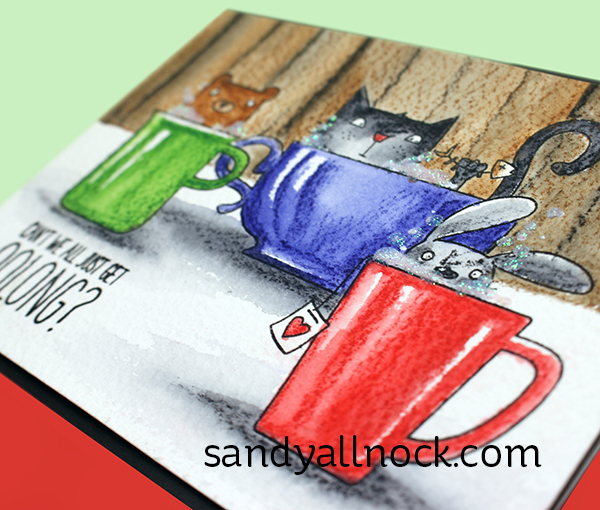 I love your stories :o) Great fun card – love the bubbles and that sentiment should be on everyone’s lips….. Your effortless coloring always makes me smile!! Love what you did with the bubbles- they look so real! Your great background stories makes the cards come to life – so fun. I make up little stories in my head about my cards too, especially Art Impressions characters. Art Impressionsville has some characters living there! I’m glad somebody else’s mind works sorta like mine. A hilarious way to end the week – it’s just, well… the cat’s pajamas!